Do you want to reduce your study and exam preparation time? Have you stressed or struggled with exams and even failed them? Listen, everyone has a different method of studying and preparing for exams. You may have even felt this yourself. You are not alone. I also want to tell you that it’s not all anxiety or test stress either. What you need and what will propel you into exam success today and throughout your EMS career is a system, a formula to go beyond just understanding the content in the exam. You need to start MASTERING the exam as a whole. I will take you inside the exam process so you can really ramp up your confidence and exam know how with this valuable training. 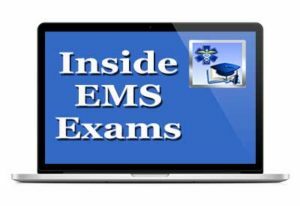 You get to Look over the shoulder of EMS educators and get the inside information you need to finally pass any EMS exam. This 90 minute workshop is designed to give you the tools and knowledge to succeed on regional, local and national exams including the NREMT. 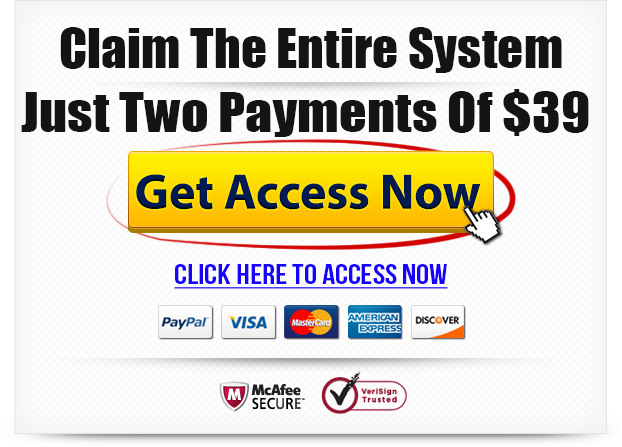 This training is the foundation of your exam study success plan. Testing Anxiety – discover how to overcome this often crippling exam side effect and the two key factors that can eliminate it. Exam Basics – how should you REALLY prepare and why your study habits may not be a problem. Get powerful study techniques that you may be surprised are at your fingertips. Exam Formats – What formats can you expect from both your instructors and state agencies. How each can hurt or help your outcome. NREMT CBT – Watch as I go underground and dispel the myths and facts on this often stressed yet vital exam process. Exam Breakdown – You get front row seats as I dissect exam questions and break down the barriers that mean the difference between passing and failing. This is why I am including the EMS Quick Study Guide which is the companion for the ems exam success formula. It covers all subjects from poisoning to cardiovascular, pediatrics to communications. This way you can pass on the first try. This powerful guide even covers techniques for history taking and physical exams as well as complete patient assessment. While it is not a complete EMS Study Resource – it is certainly one of the most valuable publications you can have in your EMS library. 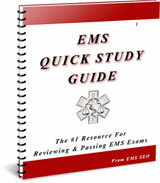 The EMS Quick Study Guide is great for new students but also perfect for refreshing EMS professionals as well. As experienced EMT’s or Paramedics you don’t necessarily need to re-read your textbook. But by using this study guide you can refresh your memory on key points that are included in any state or refresher exam. To better help you prepare for your exam I have added over 400 multiple choice practice questions so you can test your knowledge. Along with this I have added a quick start video with a Five Step plan on how to best use practice exams. This video will give you a step by step plan so you can use practice tests to their fullest and not waste your time trying to memorize every question. 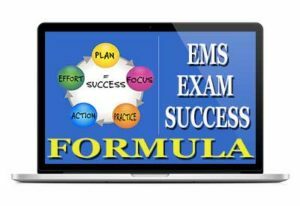 Finally, you get my EMS Exam Success Formula. I am going to unlock my system and show you my method of studying and preparing for an exam and how I coach EMS students when they are struggling. You will find you are able to use this formula for any EMS exam and you can even adjust and adapt it to your style of study. Using this formula will have you less stressed and using your time more effectively. 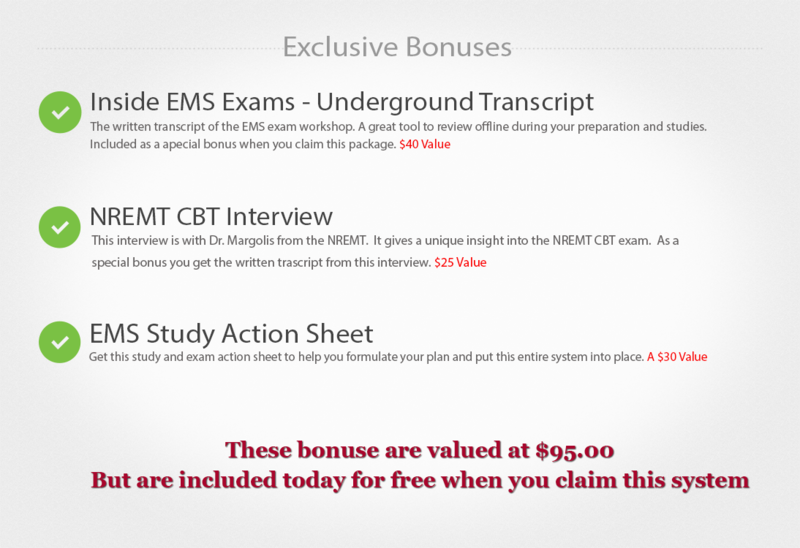 This training has been carefully produced so you can guarantee your exam success just by following a simple system that has been proven to work for countless EMS professionals. It’s waiting for you inside the members area right now.